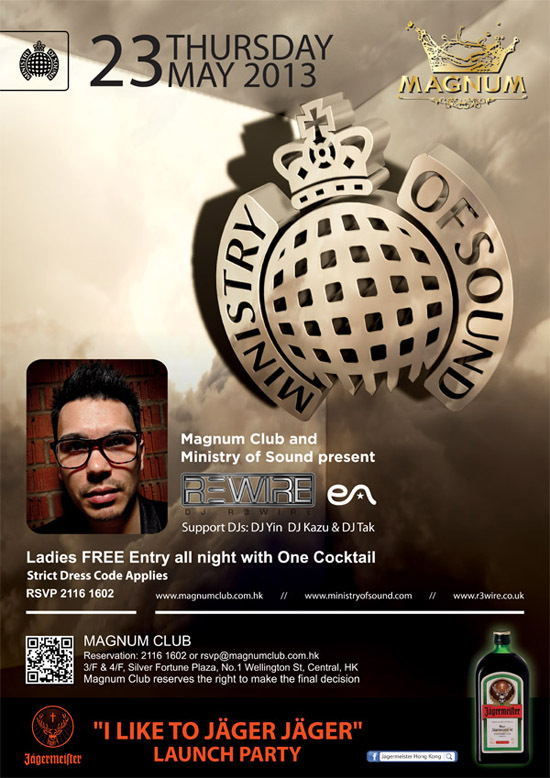 After two standout performances in 2012, R3WIRE returns to Magnum Club for Ministry of Sound once again for the second show of the Hong Kong residency in 2013. R3WIRE was born in January 2011. His DJing style is an eclectic mix of dance music ranging from Progressive House & Electro and Urban Music too! 2011 saw R3WIRE go from strength to strength gaining recognition for his DJ’ing and producing abilities across Europe. R3WIRE claimed notoriety for his remixes and bootlegs of major artists such as Beyonce, Afrojack and Tiesto to name a few. His remix of Afrojack’s ‘Selecta’ gained much success across Europe as well as his ‘Electro Pop meets Dubstep’ remix of Chase & Status’ hit featuring Delilah, ‘Time’. 2012 has seen R3WIRE making huge waves within the music/clubbing industry. Now, with over 50 Ministry dates under his belt, his most recent exploit sees him as head resident DJ on the Unitrash ‘Ice Breaker’ Tour. Never one to shy away from good tracks, R3WIRE never fails to amaze crowds by pushing fresh new music each week. Make sure that you catch R3WIRE’s unforgettable performance exclusively at Magnum Club on the 23rd May!